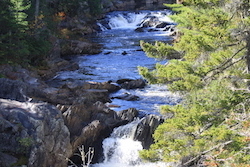 When planning your Moosehead Lake Maine vacation, look no further than Northeast Whitewater and our Moosehead Lake Things to Do! Our Moosehead Lake adventures offer things to do for all ages, abilities and guests visiting Maine for varying mild to wilder adventures. 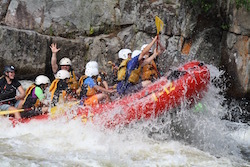 Choose from our whitewater rafting day and overnight rafting trips, Maine moose watching tours, full and half day guided hikes or a leisurely day in our inflatable kayaks on our scenic Maine rivers. Moosehead Lake is the largest lake in Maine, centrally located in the Maine highlands region of West Central Maine. It is the largest mountain lake in the Eastern United States, with over 80 islands scattered throughout its almost 75,000 acres of natural freshwater. 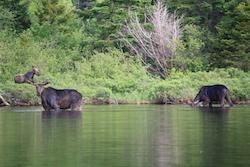 The Moosehead Lake Region is home to two State Parks; Lily Bay State Park and Mount Kineo State Park. Lily Bay State Park is located on the east shore of Moosehead Lake between the towns of Greenville, on Moosehead Lake’s southern end and Kokadjo, entrance to Maine’s North Woods. Mount Kineo juts out of Moosehead Lake. Its cliff face rises 700 feet high above the lakes surface. Mount Kineo is not only a site to be seen, it is a wonderful visit for a day hike. A commercial boat shuttle to Mount Kineo leaves routinely from Rockwood, located on Moosehead Lake’s western shore, during the summer months. When considering places to visit in the Northeast, the Moosehead Lake area of Maine should be a destination that tops your list if you enjoy wide open spaces, all things outdoors, and a vacation that can offer both time for relaxation and recreation. 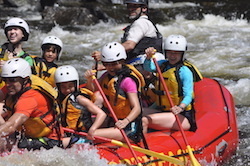 Northeast Whitewater Moosehead Lake Things To Do give your family an assortment of outdoor options to consider for both half day family activities or full day adventures on Maine’s whitewater rivers or in the wilds of our Maine woods.